Pujol-Vazquez, G.; Acho, L.; Pozo, F.; Rodellar, J. Active, passive and semi-active controls have been extensively considered to improve the protection of structures against earthquakes. 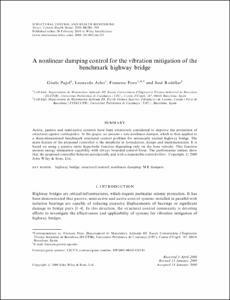 In this paper, we present a new nonlinear damper, which is then applied to a three-dimensional benchmark structural control problem for seismically excited highway bridge. The main feature of the proposed controller is the simplicity in formulation, design and implementation. It is based on using a passive static hyperbolic function depending only on the base velocity. This function ensures energy dissipation capability with always bounded control force. The performance indices show that the proposed controller behaves satisfactorily and with a reasonable control effort. Active, passive and semi-active controls have been extensively considered to improve the protection of structures against earthquakes. In this paper, we present a new nonlinear damper, which is then applied to a three-dimensional benchmark structural control problem for seismically excited highway bridge. The main feature of the proposed controller is the simplicity in formulation, design and implementation. It is based on using a passive static hyperbolic function depending only on the base velocity. This function ensures energy dissipation capability with always bounded control force. The performance indices show that the proposed controller behaves satisfactorily and with a reasonable control effort. Copyrightr2009 John Wiley & Sons, Ltd.
Pujol, G. [et al.]. A nonlinear damping control for the vibration mitigation of the benchmark highway bridge. "Structural control and health monitoring", Agost 2009, vol. 16, núm. 5, p. 586-598.